Opening in Fall 2018, yakʔitʸutʸu will house 1,475 first-year students in seven residence halls when completed. 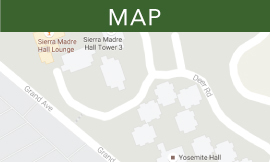 This new complex is located at the Grand Avenue entrance to campus and is right across the street from the Yosemite and Sierra Madre Residence Halls. Pedestrian pathways make yakʔitʸutʸu just a few minutes’ walk or bike ride to the campus core. yakʔitʸutʸu was proudly named honor of and in partnership with the Northern Chumash, the Indigenous Peoples of San Luis Obispo County. Each residential hall is named after yak titʸu titʸu yak tiłhini Northern Chumash tribal locations throughout the Central Coast region. The yakʔitʸutʸu residential community will also include a new Welcome Center, an adjacent parking structure, large open spaces for outdoor activities, an amphitheater, a café, community rooms, and ample bike parking. Multiple Residential Learning Communities will be housed in yakʔitʸutʸu's seven residence halls, which vary in size from three to five stories and provide double- and quad- occupancy. Each floor shares one to two common all-gender bathroom/s, depending on the size of the building. Information about sending mail to students living in yakʔitʸutʸu will be available in summer 2018. Updated information will be available at Mail & Package Services. Full-time university staff provide students with leadership and support. Resident Advisors: Student peer leaders are trained in safety and supervision and are on-call. Front Desk: Student staff serve resident needs, answer questions and check out equipment. 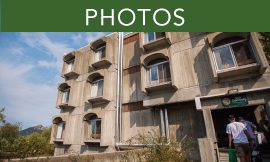 Open M-F: 11 a.m. – 10 p.m., S-S: 11 a.m. - 12 a.m.
Quad and double rooms are available in yakʔitʸutʸu and floorplans vary between buildings.